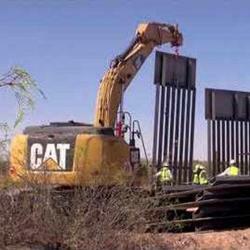 Construction has begun on the replacement of border wall in Santa Teresa New Mexico. This follows on the heels of President Trump sending 4,000 National Guard troops in an effort to slow down the flow of illegal immigrants from Central America and Mexico. <iframe width="560" height="315" src="https://www.youtube.com/embed/oyKfo6VwJ70" frameborder="0" allow="autoplay; encrypted-media" allowfullscreen></iframe>The current vehicle barrier is being replaced by Bollard fence that will be 30 feet high, making illegal entry in to the US, much more difficult. The US-Mexico border wall is just one of the campaign promises that President Trump made. This promise s one that voters demanded be met. It seems that the President, unlike any of his predicessors, is keeping his promise. More information on the replacement of the US-Mexico border wall can be found here.